A fantastic collection of Quarter Sets for the collector on your list. These coin sets are some of our most popular offerings. 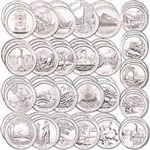 Choose from many of the most popular offerings in generations with the State Quarter and National Park Quarter issues and many other quality gift ideas. The National Park Quarter Set features all of the Denver Mint America the Beautiful series coins issued from 2010 - 2018. Each coin is brilliant uncirculated. The National Park Quarter Set features all of the Philadelphia Mint America the Beautiful series coins issued from 2010 - 2018. Each coin is brilliant uncirculated. The National Park Quarter Set features all of the Denver and Philadelphia Mint America the Beautiful series coins issued from 2010 - 2018. Each coin is brilliant uncirculated.